“Boutique-style flying experience for those who want to enjoy business class at a smart price.” That’s the basic value proposition of La Compagnie, a French airline that operates all-business-class flights from Newark to London/Luton and Paris/DeGaulle. Although at least four lines have flopped with an all-business-class product, La Compagnie seems to be making a go of it. La Compagnie flies 757s with 74 business class seats, arranged 2-2 at 60-inch pitch. Seats are, in SeatGuru’s term, “angle lie-flat,” meaning that the seat bed is flat but tilted at enough of an angle to allow a passenger’s feet to fit under the top part of the seat in the row ahead. Inflight entertainment is provided by individual Samsung tablets. Tickets include two checked bags as well as free transport for a ski bag, surfboard, or golf bag. On daytime flights to Newark, the line serves full French cuisine meals, along with a good selection of wines and liquors. From Newark, travelers are encouraged to have complimentary full dinner in Newark’s private “Art & Lounge” in advance of a late-evening departure, with a light evening snack and morning breakfast served in flight. 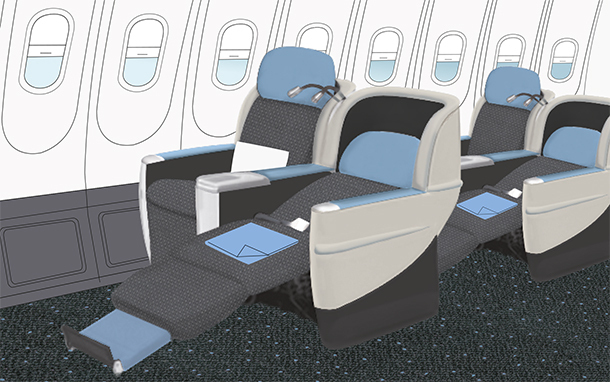 La Compagnie flights include access to independent departure lounges at all three airports. Year-round capacity-controlled round-trip prices generally start around $1500 to $1600, and La Compagnie frequently offers special pricing for two traveling together. In January, 2016, for example, the offer was two round-trips to London for $2500 ($1250 each); a concurrent promotion featured $1500 round-trips to either London or Paris for one person, subject to availability, and still other promotions were posted. Those fares are about equal to premium economy on the giant lines and close to regular economy in peak summer periods. By contrast, January nonstop business class round-trips from New York on the giant lines started at $4524 to London and $7420 to Paris, and true premium economy started at $1413 to London and $1452 to Paris. In February, 2016, from Newark, La Compagnie flies three times a week to London and five times a week to Paris. London flights leave Newark at 10:20 pm and arrive at 10:30 am; Paris flights leave at 8:35 pm and arrive at 9:40 am. Return flights leave London at 4:00 or 5:45 pm, Paris flights leave at 11:30 am. By April, frequencies will increase to six weekly London flights and daily Paris flights. Newark and DeGaulle (terminal one) need no elaboration here, but Luton may be unfamiliar to most American travelers. For many years, it has been the primary London airport for cheap charter air/hotel package flights, and it is the original London base for EasyJet. It’s 33 miles from central London, about the same distance as Gatwick or Stansted. To get to central London, a short shuttle bus to Luton Airport station connects with frequent trains to St Pancras, City Thameslink, and Blackfriars stations. It’s sort of a “time warp” airport, with no jet bridges and a 1970s ambience, but at least it has a lounge and the rail access is good. La Compagnie’s version of business class is not up to the current standards of the giant lines, which have either already installed or are upgrading to truly horizontal flat-bed seats, nor does its cabin service match the best giant line offerings. Clunky Luton airport is also a bit off-putting, although the one time I flew La Compagnie, I found essentially no immigration line at all and the total processing was much faster than you typically find at Gatwick and Heathrow. But La Compagnie isn’t trying to compete with business class on the giant lines. Instead, it’s offering a “business class light,” the equivalent of, say, 85 or 90 percent of the giant lines’ product, at 20 to 30 percent of the giant lines’ prices, and a far superior product than the giant lines’ premium economy at about the same and occasionally lower prices. That’s a compelling offer—an unbeatable deal for anyone looking to escape cattle-car economy on a flight from Newark to London or Paris without breaking the bank.